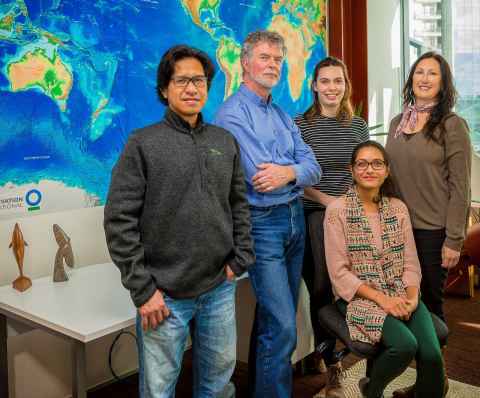 Dr Mark Costello (centre left), Dr Olive Andrews (right), Irawan Asaad, Rikki Taylor and Chhaya Chaudhary, represent staff, Doctoral and MSc students in the Institute of Marine Science, Faculty of Science, and Conservation International. The ocean is over-fished, polluted and suffering from climate change. Our team develops and uses global databases on marine biodiversity and the ocean environment to understand the past, present and future distribution of marine species. This knowledge informs the design of networks of marine reserves, and the consequences of climate change and invasive species. Our marine biodiversity research group specialises in biodiversity informatics, biogeography and protected areas. We come from 10 countries and collaborate with hundreds of researchers internationally. The unprecedented availability of data, and significant progress in discovering life in the ocean, have led us to dispel myths about biodiversity and support the need for more marine reserves to directly protect biodiversity from species to ecosystems, and act as controls for human impacts elsewhere.